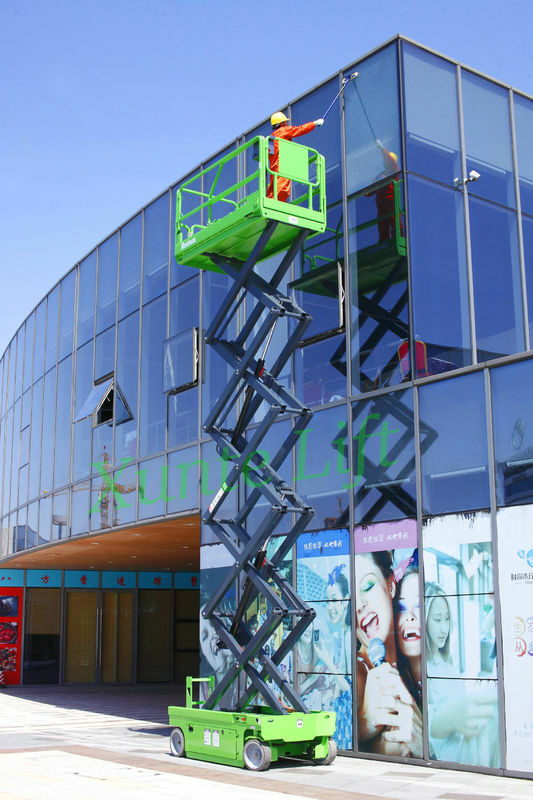 The Self Propelled Scissor lift is powerful, intelligent and flexible for material handling, construction, mending and fixing. With electrical drive, it have more comfortable and steady driving feeling, low maintenance costs, easier handling. It needs no human power to pull or push it around and it can be operated by one single to control on the platform. In any status whether lifted or stowed, it can be drived. with extensible platform, working light, airway tube, AC wiring to make it more competent to help finish various aerial work tasks in different situations. Its classic traditional design is popular with users. Platform control by joystick, advancing, backwards, right turning and left turning, auto-braking. Fully proportional control, either lifting or moving, easy operating. Zero inside turning radius for travelling in narrow space, and also facilitate changing positions. It gives full consideration to the convenience of the user in their daily work. Central management with side opening drawer for hydraulic pump, batteries and charger. It has fault diagnosis system help the user can find the failure point one time. And also reduce the losses caused by forgotten maintenance.